Hanoi (VNA) - The National Assembly (NA) of Vietnam always prioritises relations with its Cambodian counterpart, NA Vice Chairwoman Tong Thi Phong has said. The legislator made the affirmation during her talks with Second Vice President of the National Assembly of Cambodia Khuon Sudary in Hanoi on March 22. Following the state visit to Cambodia by General Secretary of the Communist Party of Vietnam (CPV) Central Committee and President Nguyen Phu Trong last month, Khuon Sudary’s visit is an important activity contributing to the enhancement of the friendly neighbourliness and comprehensive cooperation between the two countries and their legislatures, she said. Phong congratulated Cambodia on its successful organization of the general election in 2018, with the landslide victory for the Cambodian People’s Party (CPP), which, she said, has demonstrated the absolute confidence of Cambodian voters and people in the CPP’s leadership. On this occasion, the Vietnamese lawmaker also extended her congratulations to the Cambodian NA on the successful hosting of the 27th Annual Meeting of the Asia-Pacific Parliamentary Forum in Siem Reap last January. Over the past time, the exchange of high-level visits and delegations between the two Parties, States and NAs have marked new development steps in the Vietnam-Cambodia relationship, she said. Phong suggested the two sides maintain their relations through all diplomatic channels like the Party, State, and especially NA, along with people-to-people diplomacy. She called for joint efforts in educating young generations of Vietnam and Cambodia about traditions and relations between the two Parties and States, and strengthening the long-standing solidarity between the two countries. The two legislatures should intensify coordination in supervising the implementation of agreements reached by the two governments, and promoting the planting of border markers in order to build a common border of peace, friendship, cooperation and development, for the common interests of the two nations, and for peace, stability and cooperation in the region, she said. Phong proposed Cambodia to create more optimal conditions for Vietnamese businesses to operate in the country, and thanked senior Cambodian leaders for their attention to issues relating to Vietnamese-Cambodians, hoping that the community will receive more assistance to stabilise their lives. The Vietnamese leader also suggested the two sides continue to support each other at international forums, contributing to the enhancement of ties between Vietnam and Cambodia, as well as the prestige of the two countries and the legislative agencies. Phong voiced her hope that the Cambodian legislature and government will back Vietnam’s bid to run for a non-permanent seat in the UN Security Council for the 2020-2021 tenure. 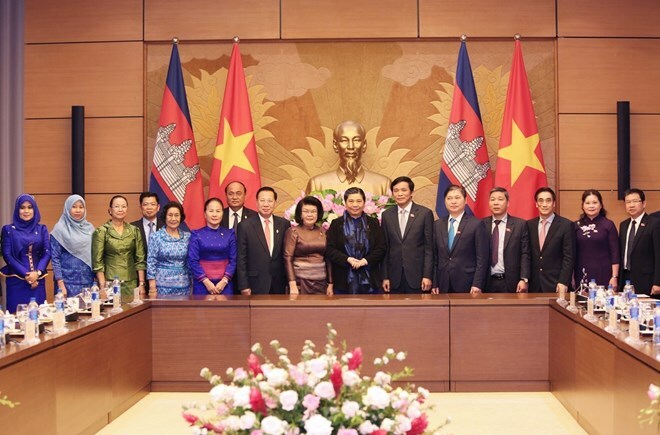 For her part, Khuon Sudary highlighted the sustainable development of relations between the two countries and their legislative ties, saying Vietnam and Cambodia boast time-honoured solidarity. Congratulating Vietnam on achievements the country has recorded under the CPV’s leadership, she said Vietnam has an increasingly important position and role in the region and the world at large. The Cambodian leader lauded Vietnam’s development and noted her belief that the country will soon complete the target of national industrialisation and modernisation. Khuon Sudary said Cambodia is stepping up the deployment of strategies in an effort to raise people’s living standards and help the country develop firmly.